Democratic congressional candidate Archie Parnell in Bishopville, South Carolina, in June. Although the South Carolina race has received little national attention, it can still give us insight into how the Democrats’ chances of taking back the House in 2018 are shaping up. The Republican is expected to win — but by how much can tell us how sour the national environment is for Republicans. Voters in the South Carolina 5th are choosing between Republican Ralph Norman, a former state representative, and Democrat Archie Parnell, a former Goldman Sachs managing director who has been using ads parodying Underwood to draw attention to his campaign. Over the past few decades, South Carolina 5 has morphed into a ruby red district. Democrat John Spratt represented it through 2010 but was dethroned by Mick Mulvaney in that year’s midterm wave. Mulvaney won re-election in landslides in every election cycle through 2016 (before taking a job as Trump’s Director of the Office of Management and Budget). Bill Clinton lost South Carolina 5 by less than a percentage point in 1996, while Hillary Clinton lost it by nearly 19 percentage points in 2016. If you look at the partisan lean of the district — measured by a weighted average1 of the past two presidential results there — South Carolina 5 is 19 percentage points more Republican than the nation as a whole. So this is not the type of district where Democrats tend to be competitive. It’s not even the type of district where they need to be competitive to win the House next year. Democrats need a net gain of only 24 seats from the Republicans to do that. And there are 111 districts won by Republican House candidates in 2016 that leaned more Democratic than the South Carolina 5th. There hasn’t been a lot of polling of the South Carolina race, but what we do have shows that Parnell is outperforming the district’s default partisan lean, just not by nearly enough. The four surveys conducted after Norman won the Republican nomination on May 16 have Norman up by 17 points (Victory Enterprises), 13 points (Gravis Marketing), 10 points (Anzalone Liszt Grove Research) and 9 points (Change Research). Even if Norman wins, as expected, we will still learn something about the state of U.S. politics. As I’ve written before, when one party consistently outperforms expectations in special elections in the runup to a midterm election, that party tends to do well in those midterms. 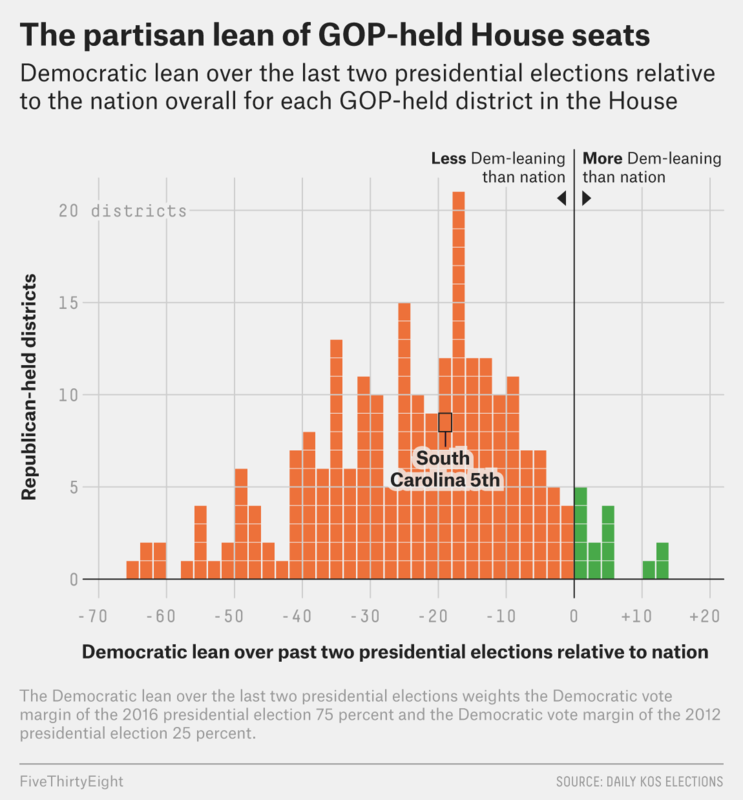 Basically, we compare how the parties do in special elections to the partisan lean in those districts.2 The average gap between those two has done a fairly good job of predicting the results of the following midterm election’s national House vote. So keep an eye on how much Parnell loses by (assuming he loses). The closer Norman comes to beating Parnell by 19 points (or more) — the default partisan lean of the district — the better for the Republican Party. A Parnell loss in the low double digits, by contrast, would be consistent with a national shift big enough for Democrats to win the House. (Democrats probably need to win the aggregate vote for the House by 5 to 8 percentage points in 2018 to take back control.) If Parnell somehow wins … well, that would be an even better sign for Democrats. If I were Nancy Pelosi, however, and looking to ride an anti-Trump wave back into the House speakership, I wouldn’t be looking at districts like South Carolina 5 to take me there. First, I’d be looking for districts with high levels of education, and South Carolina 5 really isn’t one of those. President Trump’s “reluctant” supporters (i.e., those most likely to abandon the Republican Party during his presidency)3 tend to have more education than his more enthusiastic backers. But among the residents of South Carolina 5 who are 25 years or older, just 22 percent have a college degree or higher, according to the latest American Community Survey. That ranks 328th out of 435 congressional districts in the nation. Second, I’d be looking at districts with a high percentage of voters who live in urban areas, and South Carolina 5 isn’t one of those, either. Trump’s disapproval rating in urban areas is well above what it is in rural areas. Not surprisingly, Republican candidates in other 2017 special House elections have seen their support erode more in urban areas than in rural ones. In the last decennial census, over 80 percent of Americans lived in areas categorized as urban by the Census Bureau, while only 55 percent of South Carolina 5 residents did. That’s a lower percentage than any district that’s had a special House election so far this year. In short, this isn’t the sort of district where the first signs of an anti-Trump movement would show up. Parnell’s best shot of coming within single digits of Norman (or winning) is if Republican voters in the district don’t turn out to vote. Democratic turnout in 2017 elections so far has been quite strong, and Republican voters may think Norman is a sure thing in a race that hasn’t received much attention. Democrat James Thompson nearly pulled off an upset in the special election in Kansas’s 4th Congressional District under similar circumstances in April. If Democrats in South Carolina 5 have high enthusiasm and Republicans are lulled into not voting, it may actually be good for Parnell that no public poll has shown a tight race. Most of the exciting action tonight is going to be in Georgia. If South Carolina 5 steals some of Georgia 6’s thunder, Republicans are in a lot of trouble nationally. We put a bit more stock in the more recent result, so the average gives three times the weight to the 2016 election as the 2012 one. As above, we’re measuring the partisan lean of a district using a weighted average of its last two presidential results. As measured by people who said they voted for Trump but were not excited about doing so.